The trip begins mid-afternoon with a pick-up at one of our central locations in Kailua Kona or at the Queen’s Marketplace (Waikoloa) or at the Jct. of Hwy 190 and Daniel K. Inouye Hwy. As we drive up the mountain, we learn about island geography, geology and natural history. While acclimatizing and dining at the Mauna Kea visitors center , you’ll find out why the world’s largest telescopes are located on this spot. And you’ll learn a bit about the lives of astronomers who work there. Before leaving the visitors center we issue parkas and gloves (the warmest available) and engage our four wheel drive for the steep 1/2 hour drive to the summit area. On the summit, your guide will point out the observatories as they begin to open and rotate into position. 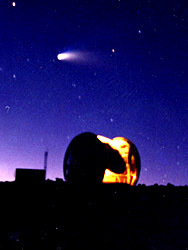 You’ll learn about famous observatories such as Keck, Subaru and Gemini. There is plenty of time for photos while the sunset transforms the area into a beautiful and quite unearthly spectacle. When the best of the color has past, we descend to mid-mountain, where the sky is equally clear but the climate and air density is much more comfortable for stargazing. Almost every night we explore the night sky using our large portable telescopes*. Using high power green lasers our guides are famous for their ability to locate the treasures of the night sky and interpret them in a way that everyone can understand. Midway in the evening we serve hot drinks and cookies to help take the chill off . The tour is 7-8 1/2 hours in duration depending on where you join it. The actual schedule of the trip varies throughout the year according to sunset times. *The Stargazing component of our adventure depends on natural conditions. 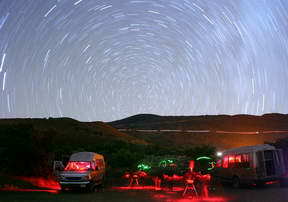 Although more than 90% of our trips have fine stargazing conditions; MKSA does not guarantee the weather in any way. In addition to being flavorful and healthy, this delicious menu also travels well on the tour and will warm you up. A hearty portion of 3 Cheese vegetable lasagna served with a big homemade chocolate brownie. Bring your own beverages (no alcohol). We do provide filtered water during supper. There are beverages and snacks available at the Visitors Center. Option: You may delete the meal (for a savings)and bring your own. *Please note that the Mauna kea Visitor Station gift shop is currently closed for renovations. Officials have informed us that the Visitor Station is scheduled to reopened Summer 2019. This does not impact our ability to stargaze or visiting the summit. An optional TIP of $5-10 per person for good service is customary in Hawaii and is very much appreciated by your guide. Please ensure you read the policies stated in the Reservations page before booking your Mauna Kea adventure. See and print our 4 x 9 Inch Color brochure in PDF format. 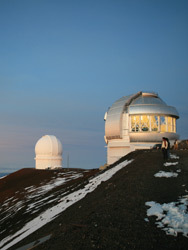 Mauna Kea enjoys an average of 325 clear nights per year. Most of the inclement nights are easily predictable. We study the weather on daily basis and when we expect poor scenic conditions are likely; we cancel the trip and refund the payment. We average 25-35 weather cancellations per year. Like any high mountain there can be unpredictable and fast changing weather. We can also be wrong in our predictions just like anyone that attempts to predict weather. If the weather should be poor for sunset and stargazing we may have to change the plan a bit to make the most of the trip. Above all, this is a trip to one of the world’s greatest mountains and we take it as the mountain and nature allow. We DO NOT guarantee the weather in any way but we do guarantee a professionally guided high mountain experience. The Climate: The average temperature is 30oF and wind is common. Please wear pants and closed shoes and bring any layering garments you may have. We will supply warm hooded parkas and gloves. For stargazing under 100% clear skies every day we recommend Imiloa Center in Hilo.